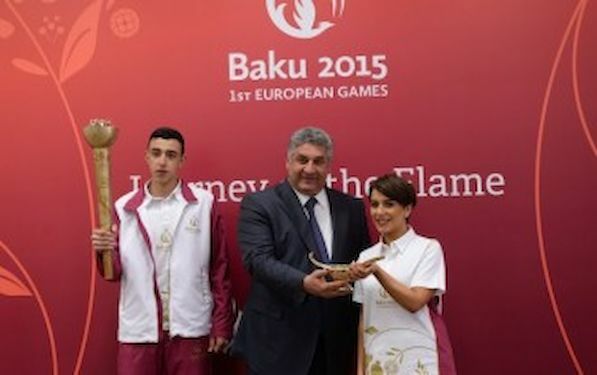 Baku 2015 European Games announced today the route of the Journey of the Flame, which will start with a ceremony at Ateshgah on 26 April, and revealed, for the first time, the design of the Baku 2015 Torch and Lamp. In a celebration of Azerbaijan’s extraordinary landscape, culture and heritage, the flame will travel the length and breadth of the country, spreading the spirit of the Games and warming the hearts of people in all 60 regions. Azerbaijan is known as the Land of Fire, so it is fitting that Baku 2015 will capture the European Games Flame from the ground at Ateshgah, an ancient and sacred temple on the outskirts of Baku, this Sunday 26 April. The flame will then travel nearly 5,500 km before the cauldron is lit at the Opening Ceremony on 12 June – 47 days later. The torch will come within an hour’s travelling time of 99% of the Azerbaijani population, and thousands of people are expected to join in the daily celebrations along the route. There will be more than 1,000 torchbearers in total. The torch will be transported over ground by bus, funicular railway, bicycle; underground on the Baku metro; on water by boat; and in the air by plane. The Baku 2015 Torch and Lamp were art directed by Yarat and designed by Sebastian Bergne. They are beautifully designed, engineered and crafted, using materials and techniques inspired by traditional Azerbaijani metalwork. The torch measures 660mm high, and its body features a pomegranate tree, echoing the Baku 2015 brand. The copper head that protects the flame is also in the form of a pomegranate – its 50 pips representing the number of nations participating in the Games. At each location, the flame will be transferred to an oil-fired lamp, based on an iconic Azeri design incorporating the pomegranate tree motive from the torch and games identity.